Friend, what are your dreams? Those dreams you have in your heart of hearts? God has planted them in the very fiber of your being. His plan for your life is connected to your deepest desires. But why is it that your dream remains a dream? There are some important principles you still need to learn and apply, like what to do when your dreams are bigger than your resources, how to marry your purpose and hire your strategy, and find God’s solution when you encounter obstacles that stop you from fulfilling your dream. What are you waiting for? It’s time to make your dreams come true. This book will change your life. Powerful words compiled in a book! 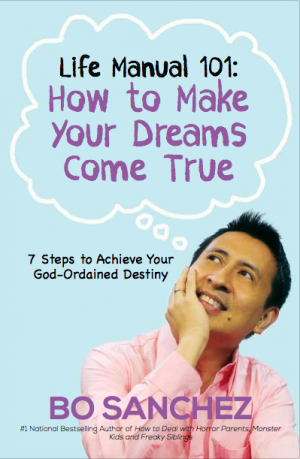 This book won’t literally make each of our dreams come true in a snap but what I’m sure of is that this book will push you to make all things possible in order to fulfill your dreams. Each of us has the power and the ability to turn our dreams into reality. No dream is impossible for a person who makes it possible. Go all the way for your dreams! It’s never too late! May God’s grace and blessing be with you as you fulfill each and every dream. Life manual 101: how to make your dreams come true.